The Design Team faced the challenge of communicating spoken themes in a visual form. 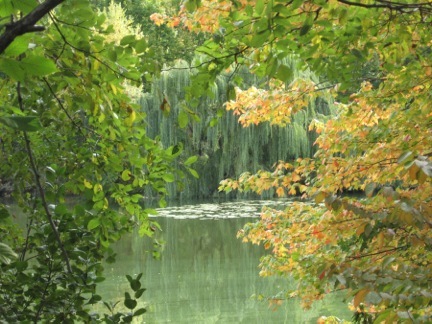 The dappled, green, orange, and yellow pattern seen on the signs, flier, and web page, was inspired by a picture of the pond in a full algal bloom. The image is both incredibly beautiful and telling about the contemporary challenges facing the pond. Although the algal bloom is a symbol of Mashapaug’s present, on the fliers we used the original shape of Mashapaug Pond, taken from a Sanborn Map, to incorporate the past. The palette we derived from the photograph is lively, vibrant, and diverse, reflecting the colorful and varied stories shared throughout the tour. We wanted to include the shape of Mashapaug Pond in all of our imagery because, although the stories are not limited to the pond, the pond is the centralizing force. In the signs we used the current shape of the pond, to reflect the physical changes made over time. We chose not to use photographs in the signs and fliers to allow the audio component of these tours to dominate. We decided that we wanted the visual component to enhance but not overwhelm or dictate the audio-tour experience. The abstract imagery allows the listener to visualize what they are hearing with their imagination. Community involvement was extremely important to us throughout this process. One of the signs will display art from Sophia Academy, where another group of students in this class worked on this project with 6th graders attending the school. This partnership with these students will be present both in the audio and visual content of the tour. We also worked with Holly Ewald from the Urban Pond Procession, and Howie Sneider from the Steel Yard, to create frames for the signs. The leaf and vine motif on the frames is meant to evoke the nature around Mashapaug Pond. The silver color of the frame represents the silver of Gorham. These frames will be used by the Urban Pond Procession for art displays in the future after our tour ends. All of the visual materials were designed to incorporate snippets of stories, suggestive of the tour, but obscure enough to not distract. The shapes and colors capture the landscape the tour describes, guiding the sensory experience. 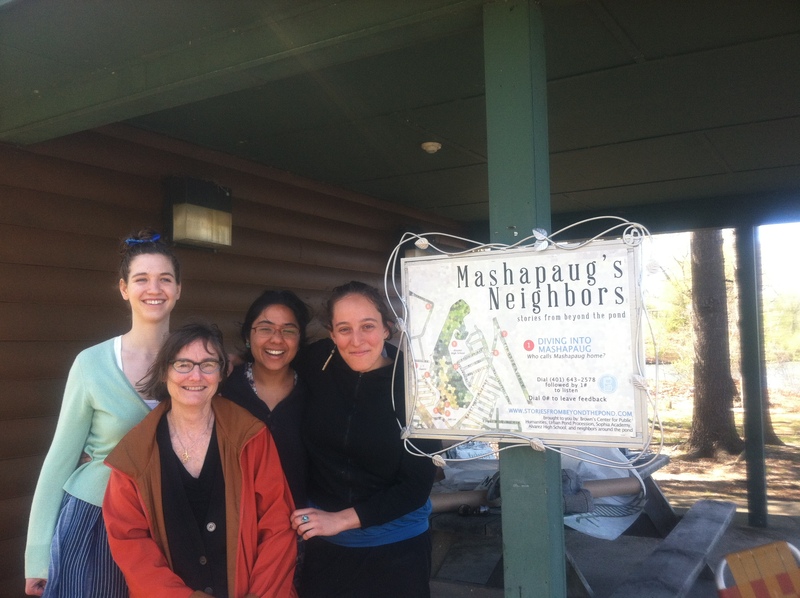 An photograph of the signs created by the design team at the Community Boathouse on Mashapaug Pond. around it, from bottom to top. I am not saying that I don’t sometimes ggo short though. You and a skeleton force oof soldiers need to hold the church against a major counterattack.